Home Page > Uncategorized > Women of our lives, The event to celebrate the International Women day. In a room gently perfumed with lemongrass scent, with wide screens showing slide shows of women from diverse horizons and conditions, stands the perfect decor to welcome the event « Femmes De Nos Vies/Women of our lives » organised by Team Jeune Africain Moderne (JAM), as a pretor before the International Women Day. Saturday 4th of March 2017. It’s 3.30pm when numerous participants start entering the Citronnelle room in Hôtel Azalaï in Marcory (Abidjan). 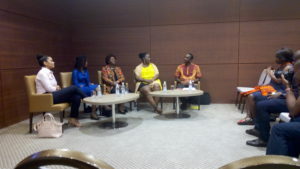 Men and women came to exchange with the four panelists of the day. As par of the program:family life, couple’s life, profesional life and others’ perceptions. One by one, the members of the panel, Dr Eliane Ekra (Directeur de Cabinet au Ministère de la Santé et de la lutte contre le SIDA/ State Secretary a the Ministry of Health and fight against AIDS), Anouchka Wayoro (Responsable digital et e-commerce chez Orange CI/ Digital and e-trade Head at Orange CI), Yvette Akotchi (Contrôleur aérien/air trafic controller) and Angel Chow-Toun (Productrice/Producer) shared their experiences. About family life, Dr Eliane Ekra insised on the fact that man is the Head of family, whatever the institutions are trying to tell us. And in his role as Head, the man must serve his family, including his wife and children. For Anouchka Wayoro, it is within the family that parents must help their children discover their talents and exploit them. As far as the couple’s life goes, Dr Ekra Eliane jokes about how « a couple is not an ice-cream we taste and throw away because it does not to our liking». She drew attention to the fact that not everyone is made for married life as it requires a real commitment and is a vocation. Women don’t only strive to be good mothers and wives, they also want to be successful in their career. It’s Angel Chow-Toun’s case, who, from very early age and thanks to her mom’s support, discovered her talent for writing scenarios. Today she is a successful director and movie producer. «You must establish limits in your relationships with others to avoid being seen as easy women. You have to stay profesional all the time.’» she advised the public. Anouchka Wayoro added : « We came to work, to work and nothing else.» Yvette Akotchi, works in a more manly field and she still manages to earn respect from her male colleagues. For the Others Perception theme, the event partner, Muriel Boni from the Fairy Wives association, shared her experience. She invited all women to live their life without worrying about gossips or trying to please others which can hold them back. Muriel built awareness and helped women realise their importance and their influence in society so they can fully reach their goals. The Wiki Loves Women Team was represented and took advantage of the event to introduce their mission to the public. It’s with great happiness that they met a #WomenToKnow, Dr Eliane Ekra, who committed to give more documents to help writing out her biography on Wikipedia. It was a great event, full of practical advice, experiences and stories thanks to our great panelists and our participants.